C.J. was the senior pastor at Covenant Life Church (CLC) when the alleged sexual abuse occurred in relation to Norma Noe, Robin Roe, and Grace Goe. He was interacting with Defendants Loftness, Ricucci and Layman and providing them counsel. Steve Shank had apostolic responsibility for Sovereign Grace Church of Fairfax (SGCF) when the alleged sexual abuse occurred in relation to Jane Doe, Karen Coe, and Karl Coe. He was interacting with Defendants Ecelbarger, Phillips, D. Hinders, Gallo, Mullery, V. Hinders and providing them counsel. Steve was also in contact with C.J. regarding these matters. 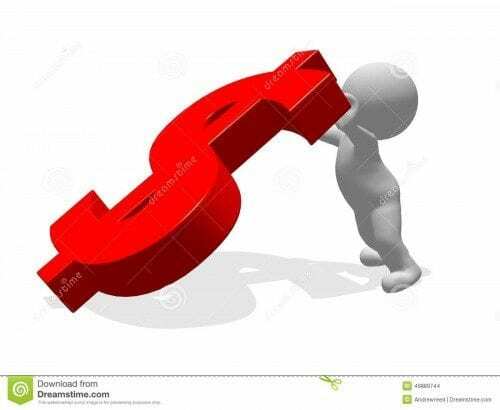 The pastors at CLC and SGCF did not act on their own. C.J. and Steve played significant roles in providing them counsel and direction in these situations. This should come out in the discovery phase and then in the court trial if the case proceeds. In my opinion, Steve Shank should be added as a Defendant. Shank was last seen in his role of a Sovereign Grace Regional Leader on November 22, 2015, preaching at Sovereign Grace Church of Tucson. 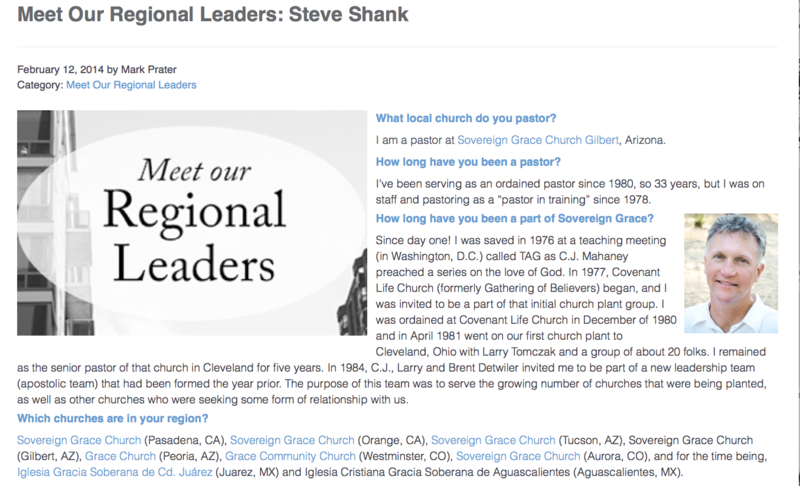 A few weeks after Shank was removed from the Gilbert website he was also removed and replaced from the listing of Regional leaders on the Sovereign Grace national website. (Although numerous other references on the site can still be found to Shank as a Regional leader. Since Brian DeWire was fired from his job the Sovereign Grace national website doesn’t get much attention.) Replacing Steve Shank is the relatively inexperienced Jason Hansen. 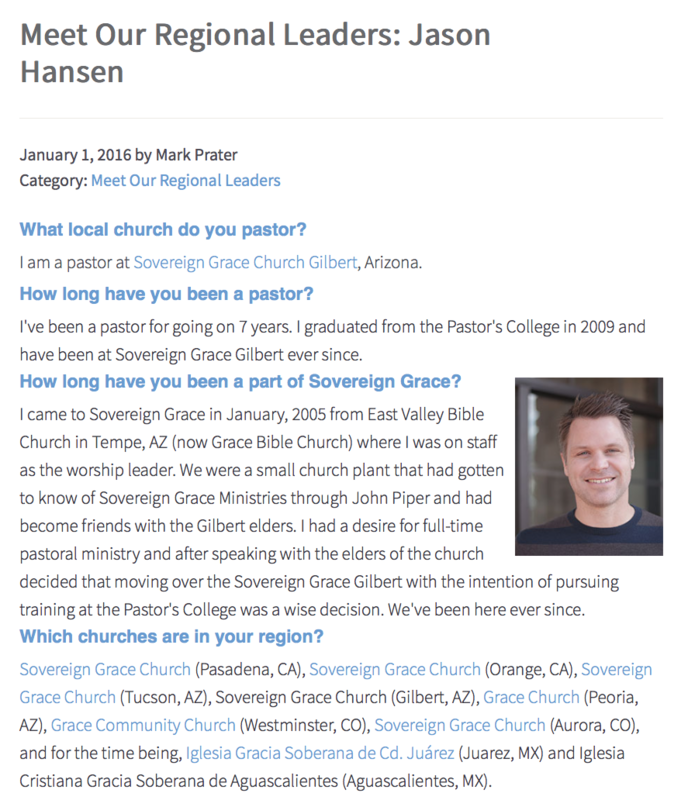 Hansen graduated from the 9 month Sovereign Grace “Pastors College” in 2009 and has been on the Sovereign Grace Gilbert staff since then. I heard him preach when I was in Arizona last summer. You can read my impressions here. It’s hard to believe that such an inexperienced man would be appointed to such a responsible position, but perhaps choices are somewhat limited after 40 churches have left the denomination. Here is Dave Harvey speaking warmly of Steve Shank back in May, 2008. Harvey and Shank were both apostle’s in the Sovereign Grace denomination (prior to the denomination dumping the moniker in an attempt to gain respectability). Harvey even had a short stint as the leader of the denomination after Mahaney was forced to resign. Here is Glynn McKenzie, Senior Pastor of Grace Community Church in Westminster, CO, speaking warmly of Steve Shank. This is from June of 2015. I included these two warm endorsements of Steve Shank to show that the man had power and prestige in the Sovereign Grace denomination. Folks, I am telling you that something is rotten in Denmark. A high visibility leader like Shank does not just quietly disappear. Not a word has been said about him. I wrote an email to Sovereign Grace inquiring what has happened to Shank, not surprisingly they haven’t responded. Sovereign Grace churches are known for giving standing ovations at the drop of a hat. Exhibit “A” is the recording below. Grant Layman announced he would be resigning from the pastoral staff of Covenant Life Church. He was under great pressure as one of the defendants in the sexual abuse lawsuit and had been subpoenaed to testify in the Nathan Morales criminal trial. 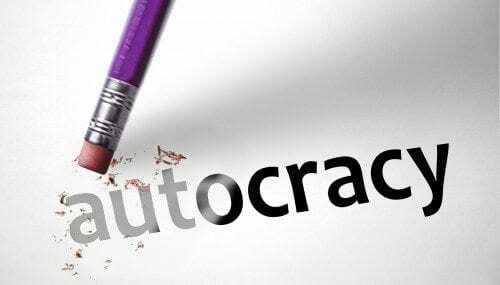 He actually was resigning in disgrace, yet Joshua Harris praised him as an example of “finishing well” and the church gave him a lengthy standing ovation! Eventually the facts will come out. In the meantime, if you find Stevo, please let me know. Love the theme of this post. I remember reading over at survivors about being “shanked”. Interesting how Steve Shank had disappeared without any type of announcement etc. Why the silence by SGM on this departure? One thing that was disclosed a long time ago on SGM Survivors was that Steve Shank’s wife Janis both “diagnosed” and “treated” a woman of near normal weight (low in the range) for anorexia. Steve allowed his wife to do this without her having any training in the area. It was basically IMO spiritual abuse. Not sure why he thought his untrained wife was competent to do this type of diagnosis and treatment. In one email Steve Shank initially denied it but when pushed in a subsequent email admitted that this was the case. 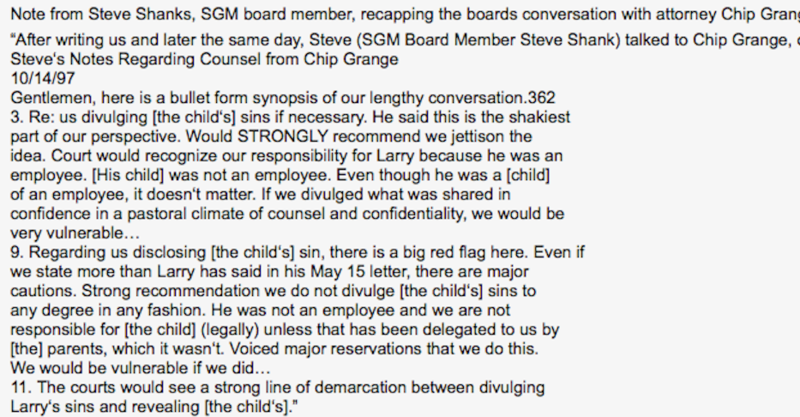 I know this article is about Steve Shank yet I’d like to point out that it also raises some questions about the integrity and moral grounding of long-time Covenant Life Church attorney Chip Grange, of the law firm Gammon and Grange based in Virginia. Mr. Grange claims to be a Christian lawyer yet in both the excerpt above and in a longer document I’ve read about the subject of black-mailing Larry Tomczak, he fails to tell the Sovereign Grace Ministries and Covenant Life Church leaders in question that black-mail is generally considered immoral by Christians and non-Christians alike. Furthermore, the casualness with which Mr. Grange addresses questions about the nuances of the legality of blackmailing a business partner over the alleged sexual misconduct of his minor child, suggests that he has helped the CLC and SGM leaders in question navigate other legal issues without respect to the moral issues they raise. I know some folks may argue that all lawyers lack moral grounding. 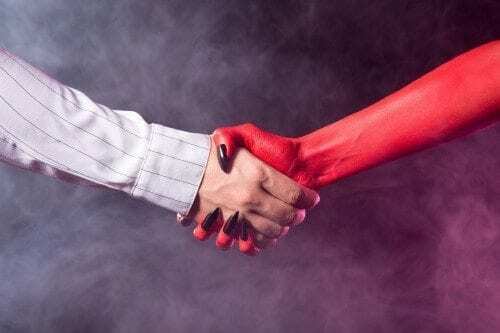 😉 That’s just an opinion, but I will say that the lawyers I’ve retained over the years would likely have thrown me out of their offices if I had asked for a written opinion about the legality of black-mailing a business partner over the alleged sexual misconduct of his/her minor child. After they told me that doing so was immoral and illegal. And especially if I had bullied that “confession” out of the kid as C.J. Mahaney did. 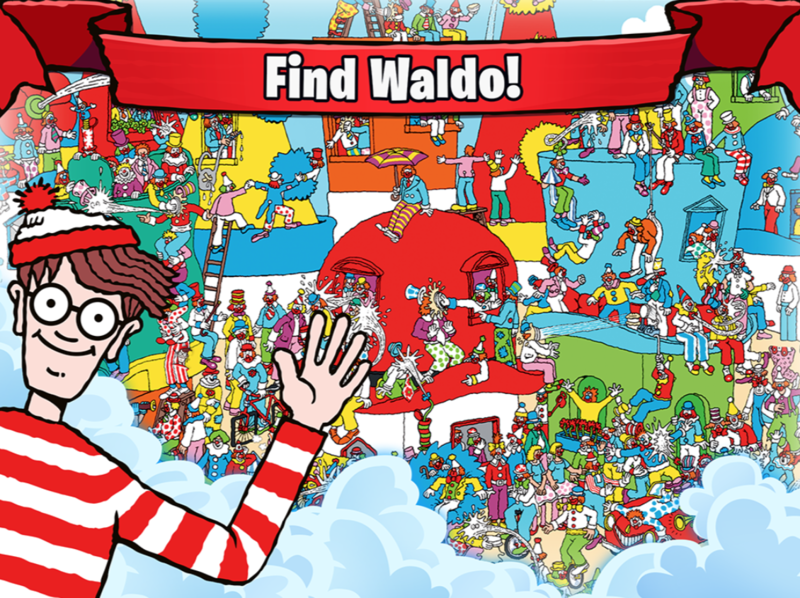 Hey Buddy!, I found this information for you: "Find Stevo!". Here is the website link: https://thouarttheman.org/2016/02/02/steveshanks/. Thank you.